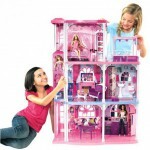 OUR CHRISTMAS PICK: Barbie dollhouse with elevator! With so many Kids Toys available to buy we can be a little lost when it comes to deciding just what to get. Well, we should all remember that the classic Dolls and Toys, like those in the Barbie collection are still extremely popular, none more so than the amazing Barbie Townhouse. Let her move her favourite Barbie right in. The less favored Barbies can be allowed to visit. The elevator, which works really well, is a big hit with the kids. Anything with sound effects in fact – the toilet flushing, crackling fireplace, singing in the shower, and doorbell – will be in constant use in the Barbie Pink Dream Townhouse.